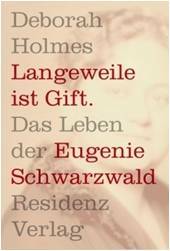 Dr Deborah Holmes, Head of the Department of German, has recently published a new book on the education reformer and social activist Eugenie Schwarzwald. Entitled Langeweile ist Gift [Boredom is Poison], the book was published by Residenz Verlag in 2012. Deborah was interviewed on Austrian state radio on 4 October 2012. To listen to the interview click here. Eugenie Schwarzwald (1872-1940) has become an icon in the German-speaking world; her name became in its time a label. Her creation of ‘Black Forest’ schools in Vienna of the turn of the century promoted a curriculum of creativity and imagination, and an ethos of non-violence. In these secondary schools, girls were given the opportunity to graduate with practical skills and gain modern languages. In her kindergarten and elementary schools, there was even a novelty – coeducation. Until forced to emigrate in 1928, her home was a kind of salon: a meeting place for writers and intellectuals of the Viennese turn-of-the-century.